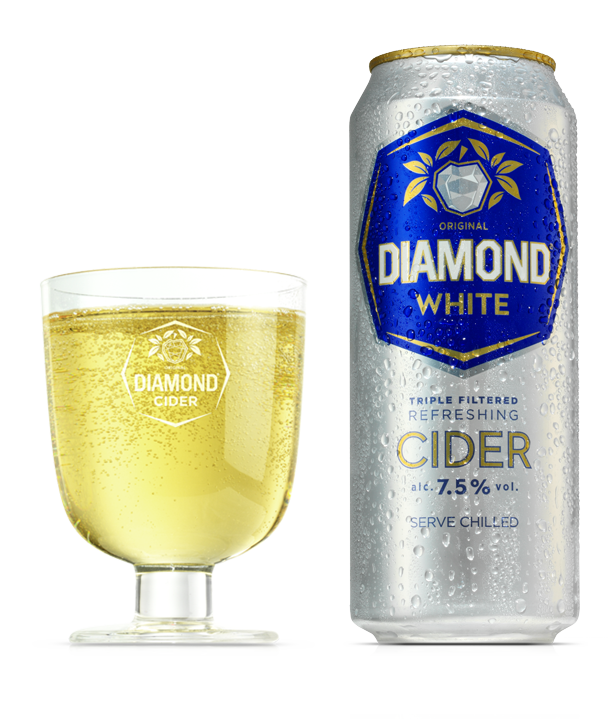 DIAMOND WHITE is a great British cider crafted using superior ingredients to create a product of premium quality. The careful crafting involves triple filtration, a process which creates a clearer, crisper and cleaner cider, offering a greater level of purification than using a single filtration process. The carbonation process allows us to create a refreshing and palatable cider whilst also releasing the flavour profiles, making Diamond White light and bubbly, with a scintillating sparkle. The high apple juice content creates a flavoursome, fragrant and fruity cider. Diamond White is unequalled within its category, offering a unique premium product that can be enjoyed in a whole host of ways. Being highly adaptable, Diamond White is perfect for consumption on its own, as a long drink chilled or over ice, with other drinks as a cocktail and always delicious as an accompaniment to food. Now available in a new, contemporary design, in a 500ml can and a 2 Litre bottle. Did you know that Diamond White is a perfect alternative to wine, averaging half the alcohol content? Swap your weekend tipple and reduce your units. For more serving suggestions, take a look at our Best Served section on the news page.